ORIGINALLY LAUNCHED IN 2007 WITH THE BIRTH NAME BACCHANAL MAS, WE HIT THE ROAD AT NOTTING HILL CARNIVAL AS UCOM FOR THE FIRST TIME IN 2012. 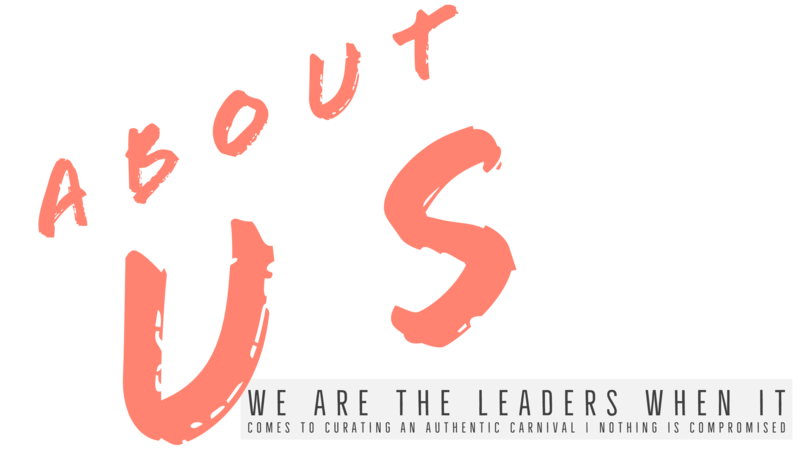 UCOM NOW COMBINES SOCAHOLIC UK, AMOROUS MAS LONDON AND SOCAMANIA TO FORM UCOM CARNIVAL & ASSOCIATES AND WILL BE JOINED ON THE ROAD FOLLOWED BY HYPE MAS. THE BAND’S CREATIVE DIRECTOR, PAUL O’DONOGHUE IS AN AWARD WINNING INTERNATIONAL DESIGNER AND HAS BEEN IN THE BUSINESS OF COSTUME DESIGN AND MAKING MAS FOR OVER 20 YEARS. THE BAND CONTINUOUSLY STRIVES TO BE ORIGINAL AND GROUND-BREAKING, AT THE SAME TIME PAYING RESPECT TO THE TRADITIONS OF CARNIVAL BY CREATING MAS WITH MEANING AND COSTUMES THAT TELL A STORY. JUST DROP IN, GET INVOLVED AND KEEP THE CARNIVAL RITUALS ALIVE. THE BAND IS CONSTANTLY INNOVATING, IMPROVING IT’S PRODUCT AND SERVICE TO STAY AHEAD OF THE REST AND BEING ON THE ROAD WITH UCOM YOU CAN EXPECT THE SHOW-STOPPING COSTUMES THAT THEY ARE RENOWNED FOR AND MUCH MORE. UNIQUELY, UCOM HAS A MAS CAMP THAT IS ACTIVE YEAR ROUND AND IN THE RUN UP TO CARNIVAL, THE DOORS TO THE WORKSHOP ARE OPEN TO ANYONE INTERESTED IN LEARNING ABOUT CARNIVAL ARTS AND THE CRAFT OF MAKING MAS. AT NOTTING HILL CARNIVAL, UCOM OFFERS AN UNRIVALLED, PREMIUM TWO DAY CARNIVAL EXPERIENCE AND IS ALL INCLUSIVE IN EVERY SENSE, WELCOMING PEOPLE INTO THEIR CARNIVAL FAMILY FROM ALL WALKS OF LIFE AND FROM ALL OVER THE WORLD, REGARDLESS OF RACE, NATIONALITY AND SEXUALITY.